Once you are happy with the data items in the system you can then edit the Profile Pages in the system to manage the Sections that appear on those pages and the Data Items that appear in those Sections. To manage Profile Pages you need to go to the Profile Manager tool and click on the Manage profile pages button (shown in Figure 14). Figure 14 The Manage profile pages button. 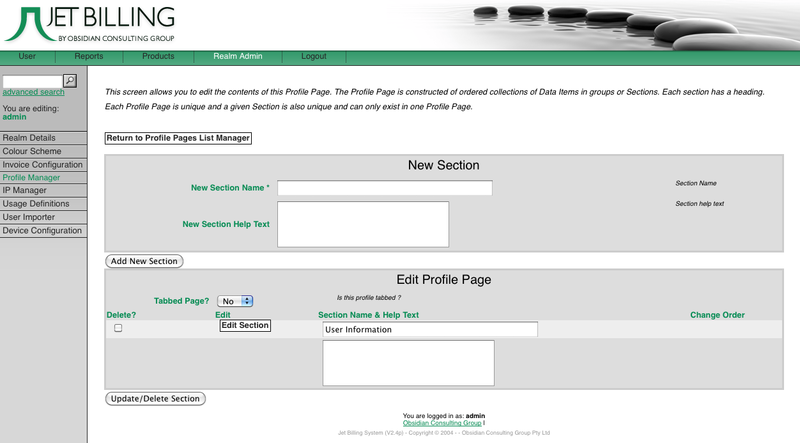 This will take you to the Manage Profile Pages page (shown in Figure 15) that lists all the profile pages in the system. Profile pages cannot be added or deleted from the system through this interface, this can only be done by Obsidian. Figure 15 The Manage Profile Pages page. You can select a Profile Page to work on by clicking on its hyperlinked name. Figure 16 The Edit Profile Page page. Add/Create a new Section: Create a new section on this page. You perform this action by filling in the name for the new section in the New Section Name field and clicking the Add Section Once the Section has been added you can then edit it further. Delete a Section: Select the Section(s) you wish to delete by checking the relevant checkboxes in the delete column and then clicking Update button at the bottom of the screen. Edit a Section: Perform this action by clicking the Edit button next to that Section’s name in the list. Change a Section’s Name: Change the Section’s name in the text field and then click the Update button at the bottom of the screen. Change the order of the Sections on that Profile Page: Click on the [Move Up] [Move Down] hyperlinks next to the Section you wish to move.